Last time, we completed Questprobe Featuring the Human Torch and the Thing, the third and final Questprobe game to be released out of a planned twelve games. Shortly after that game came out, Adventure International faced bankruptcy and all of the games in progress were cancelled. 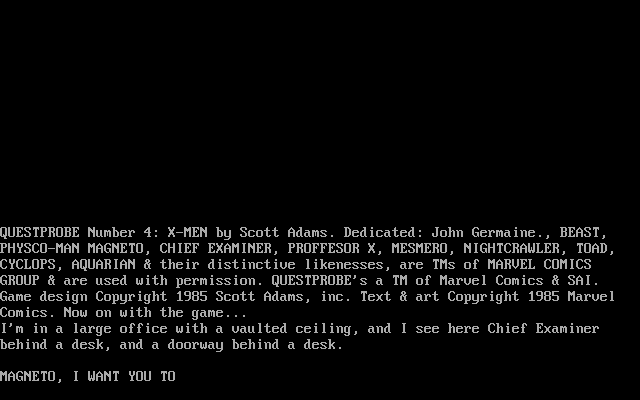 That would have been the end of the story except for two things: Scott Adams had already started work on the fourth Questprobe game and had it in a partially working state, and Marvel would revive the character of the Chief Examiner a few years later to wrap up the Questprobe plot line. The most amazing part of this is that Scott kept the partially completed game stored away and has been generous enough to allow me the chance to play it. This is a “Lost Classic”, a game that could have been. Next week we will post interviews with Scott Adams and Kem McNair, then we will wrap it up with a final epilogue as we look at Marvel’s continuation of the characters as well as a few surprises. Before we begin, let me make clear what I have: I will be playing a pre-release version of Questprobe #4 written for DOS. 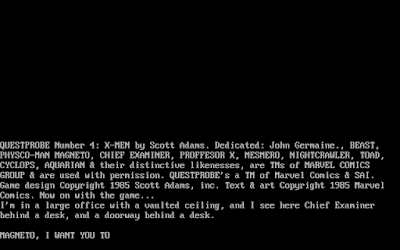 The title in the in-game text is Questprobe Number 4: X-Men, but my suspicion is that this would have been changed to “Questprobe Featuring the X-Men” or similar before release. No tie-in comic was released for this game (although there is some evidence that one was started; we’ll discuss that in two weeks), nor do we have a manual. I played the game straight without hints for most of the review, but not all of the puzzles are hooked up yet and I will augment my review with information from unpublished design notes that Mr. Adams has graciously provided. The graphics for this game were not yet completed and I will be illustrating it as best I can using scenes from the other Questprobe games and anything else readily available. The most important thing that I need to underscore is that this is an incomplete game. My opinions are based on what I have in front of me, but it is certain that Scott Adams would have refined the game and its puzzles many times before release. 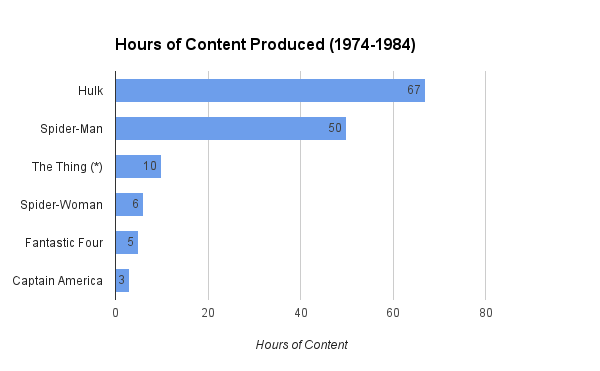 Quite a lot is playable, but that is not the same as having quite a lot in its final form. Got all that? Let’s begin! 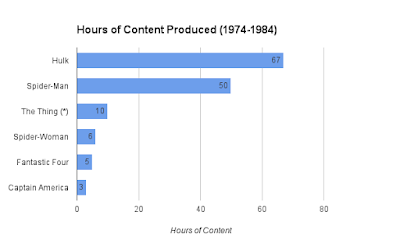 The X-Men are missing from this chart. For the previous three games, I made the discovery that the characters involved exactly corresponded with television presence: first the Hulk, then Spider-Man, then the Thing. This may have been a coincidence or something subconscious, but it matched perfectly. But when it came to game number four, the model breaks down completely. By my guess, the next character should have been Spider-Woman. She had a short-lived TV series around that time which I discussed back during the Spider-Man introduction. But perhaps her powers would have been too similar her male counterpart? In that case, perhaps the rest of the Fantastic Four or Captain America should have been next. Any of those three would have made for a great game! But as it turns out, the real choice for the fourth game was the X-Men, a group that had almost no television exposure at all in this era. Were they were known enough among non-comic book fans to sell the game? I have no idea. Of course today we have a very different view: the X-Men are some of the most well-known and commercially successful comic book characters in the world. Questprobe Featuring… Magneto? An X-Men Primer. Title screen under construction. The copyright is 1985 here, but the game would have been released no earlier than April 1986. I boot up the game to my first big surprise: I’m not playing as a member of the “X-Men” at all! The game features Magneto as the first (and perhaps only) playable character. For non-comics fans, I think I need to explain the X-Men a bit. The X-Men, like the Fantastic Four, are one of Marvel’s premier superhero teams but with a twist: the X-Men are not generally liked by the public. They are “mutants”, characters born with the potential for superpowers (generally manifesting around puberty) because of genetics. There are no gamma bombs, radioactive spiders, or mysterious cosmic rays: just teenagers getting their first pimples and unexpected super abilities. But for various reasons, “mutants” in the Marvel universe are looked down upon with fear and with disdain. They are discriminated against. The publication of the X-Men was, in some fashion, a way for Marvel to discuss social problems like racism while still having people in tights punch each other. The X-Men #1, September 1963. Magneto was the villain; this is also his first appearance. 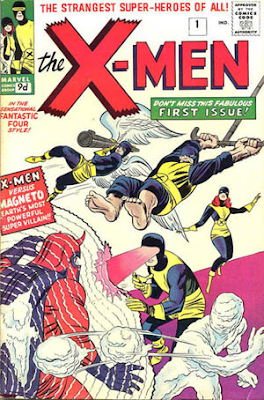 The X-Men were created in 1963 by Stan Lee and Jack Kirby. The initial team was led by Professor X with Cyclops, Marvel Girl, Angel, Beast, and Iceman. That series was cancelled in 1970, but revived five years later with new, more “international” characters. Many readers, myself included, are more familiar with this second set of X-Men including Storm, Wolverine, Colossus, Nightcrawler, and others. As the name of their leader suggests, the teenage X-Men were based around a school for students with special talents. Between the main team and their many spin-offs over the years, the X-Men have had hundreds of members, most of whom I have never heard of. The Marvel Wiki lists more than a hundred of them, not counting the many mutant background characters that study at the X-Men’s school. The shock for me is that this game is headlined by Magneto, generally the X-Men’s arch-nemesis. He is/was the leader of the “Brotherhood of Mutants”, a group that sees mutants as the future of humanity. But in December 1985, just before this game would have come out, Magneto had a change of heart and was given the leadership of the X-Men after Professor X was injured. He remained a “good guy” for a number of years and has alternated between being a friend and an antagonist to the group ever since. Magneto’s power is the control of magnetism. He can use this to control any metal that might be nearby, including the metal in his own body. The most practical application of this is that he can fly. Don’t think too hard about it; it’s just a comic book. And with that introduction, let’s play! The Chief Examiner hard at work, from Questprobe #1. Before I go further, I want to reiterate: I am not playing a completed game. To create this review, I played through the game once as far as I could without hints, just as I would any other game. After that, I reviewed Scott’s design notes to flesh out puzzles and features that weren’t in the version that I played. I will combine both to try to make my play by play as much like the real game as I can approach. Even with the design notes, this game is very much a rough draft and we can only guess at what would have changed between this stage and actual release. Just like the previous game, this one starts off in a familiar location: the Chief Examiner’s office. The Chief informs you that you must use the powers of ultimate magnetism to traverse the maze in front of you. 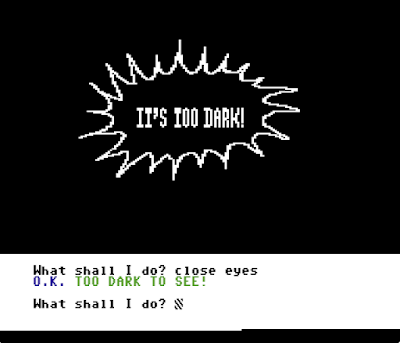 Unlike those previous games, you are not teleported anywhere but instead can walk through the door that is behind the Chief’s desk, into a room that is faintly glowing. There are no obvious exits. Welcome to the maze! Since there are no obvious exits, I start to feel the walls in each direction. When I touch the east wall, my hand goes through! I walk that way and emerge into the darkness. I have to feel around again, but can find no exits except the way that I came. I head back and discover that the west wall is also an illusion, so I head that way instead. 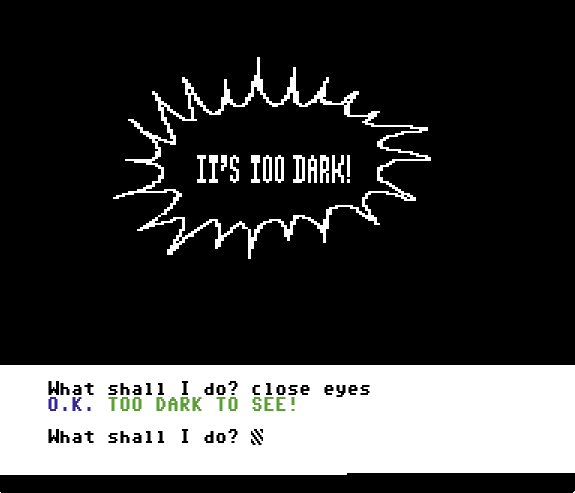 This continues on for some time as I slowly make my way through six dark rooms before I find one that doesn’t have any other exits. What am I missing? The ductwork maze from Questprobe #2. I search around and find a bit of a parser gap, understandable because of the pre-release nature of the game. When I have been typing “feel up” and “feel down”, I was getting not very helpful messages. But if I try “feel ceiling”, I find that it is illusionary in the last room that I discovered. But how do I get up there? Oh yes, I forgot! Magneto can fly! I type “fly” and then head up. No problem. The next section of the maze appears to be a bit more complicated. There is a room that has a wall covered in “ionized and sparkling water”, whatever that means, but also rooms that appear to loop back on themselves. The previous part of the maze was easy with exits leading west that you could come back east, but no more. 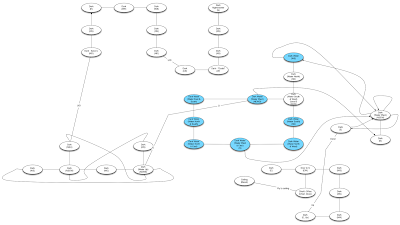 With no way to drop items to support mapping, I find the process of working out where I am gets more tedious but there do not appear (yet) to be repeats in the number and placement of exits. That is, if I find a room with a water wall to the west and a pathway to the east, and I find that same combination again, I assume that it is the same room. A short time later, I succeed in mapping all of the rooms that I can get to. What next? The water walls. I find that I can pass through the water easily enough, but drown immediately. What am I forgetting? That old Scott Adams staple command: “hold breath”. I do so and I can last in the water for a few turns. But just as before, it’s pitch black and I have to feel the exits to see what ones are there. Obviously the “ionized” water is a clue that it is magnetic, but I can’t find any commands that let me do anything with it. I am either missing something or it has not been implemented yet. I pass through the water room and continue mapping the maze, finding and mapping more water along. Eventually, Mr. Adams must have thought that this was too easy because then I find cases with two water rooms in a row. That’s just evil because there isn’t enough time to get to the second room, feel an exit, and get back without drowning. I can still map it, but with a lot of restoring the game when I die. This may have been adjusted before the final release, but this whole section feels very tedious. Room after room of darkness does not make an attractive “graphical” adventure game and I am not sure new gamer would appreciate the lack of scenery. It’s a bold move to have the game open in a maze, but I suspect that before release they would have found a way to spruce it up. Since I keep restarting the game to map the water sections, I screw around a bit. That’s when I discover that I can “fly up” in the Chief Examiner’s room and get close to the ceiling! And who do I spy up there? None other than Beast, one of the original X-Men! I am very excited because he is the first character in this game other than the Chief Examiner. The Beast was one of the original X-Men: a genius-level intellect in a body that is slowly becoming more animal than man. By the 1980s, he was covered from head to toe in blue fur. While fiddling around in the Chief’s room, I also notice that he really doesn’t want me to get behind his desk. I do not manage to solve this mini-puzzle, but according to the design docs there is a way to get to the stash of *gems that the Chief has hidden under there. This is a nice callback to Questprobe #1! With those, mapping the maze becomes much easier, although I managed to do fairly well without them. So, let me fast-forward: the maze is a pain in the neck and I spend considerable time just mapping it one exit at a time, in the dark. In total, I find 37 rooms before I reach a dead-end and have no more rooms to explore. In the final room, I keep hearing a “BAMF” sound. Well, any fan of the X-Men knows what that means: Nightcrawler! He was one of the second batch of X-Men, a mutant that looks like a demon (but is a conservative Catholic) and has the power to teleport himself. He teleports away whenever I try to do anything with him. The best that I can find is that when I “call” him, he taps me on the shoulder. I have no idea why. Most of the rooms are just labeled “small room” and require you to feel around to find the exits, so that much wasn’t a waste. Perhaps these would be described or themed before the game was completed. A handful of rooms are “fading in and out”. That is the clue that these are the ones with non-linear exits. Good to know, but I mapped them successfully without the clue. I find Professor X just after the water section and he tells me to “keep shields up”, whatever that means. This was two years before Star Trek: The Next Generation and 15 years before Patrick Stewart would play Professor X in the first X-Men film, so this is not an obscure Star Trek/X-Men joke. But the fact that it could have been is pretty funny. Professor X is a powerful psychic and is usually depicted in a wheelchair. I find Psycho-Man in another room. He was originally a Fantastic Four villain, first appearing in Fantastic Four Annual #5 in November, 1967. He’s an evil scientist that tries to control other people’s emotions. He also happens to be microscopic and uses a human-sized mechanical suit to interact with the world, not unlike a certain Doctor Who race. Using Professor X’s advice, I can “create shields” and then the room goes dark. Checking my inventory, I find that I am both electromagnetically shielded and physically shielded, although it is not clear how to do one or the other. I discover that I can explore the water sections with the shields up, but they also block light so doing do makes me blind again. Looking at the design notes, it appears that Psycho-Man was intended as a minor puzzle. 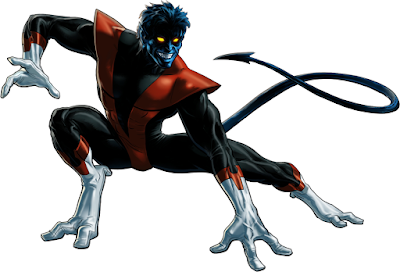 Once you get past him, Nightcrawler is supposed to give you a headband that will block his attacks further, but at this point I am in the incomplete sections of the game so it’s not clear what his attacks would have been. In the version of the game I have, he doesn’t present as an obstacle. Given that, I think it’s time to stop playing and review the rest using the design notes. My map of the game. Can’t really discern any letters here. Looking at the overall plan, there would have been four more maze-letters to explore and about 60 more rooms. I had made it only a bit less than half-way. Subsequent areas would allow you to find and recruit Cyclops, Toad, and Aquarian to join your little team. Cyclops can blast things with his laser eyes, Toad has an object that allows you to better understand the maze, and Aquarian is a key to the Bio gem puzzle. The Bio gem puzzle would have been solvable again. It would be in a room with a fake floor and Magneto could somehow (with the help of Aquarian) prevent the Natter energy egg from exploding. Toad will randomly pick up gems that you drop, so he will be an inconvenience to mapping. But he will stop if you ask him to. At some point, there will be a room with a brick wall that only Cyclops can blast through. The master of magnetism can create light, but not move masonry? Mesmero will appear as a villain. His power will make your mapping go haywire as exits will be randomized for a number of turns. And that is it. The design documents do not provide any detail as to the end game puzzles, what would have happened when you finally make it to the end of the letter maze. Perhaps the Bio gem would trigger the end, but I’m not sure. Obviously, it would not be fair to give this game one of our PISSED ratings, but I’d like to comment on what I have seen so far. A lot of editing would have been done before the final product was shipped and that game may have been quite different from this one. This game is, simply put, the most abstract of the various Questprobe games so far. If the final version would have implemented the maze as it is here, it would have been a remarkably graphics-less game with only a handful of differently illustrated rooms. The maze is very well-designed with each level increasing in difficulty, starting with a simple “feel the walls” premise, then adding water, then adding villains, and perhaps then more complex puzzles. I made it as far as I did with brute force, but it is clear that a skilled player could have found better solutions to the puzzles than I did. To offset the simpler graphics of the maze, the design document describes a bit how the characters would be rendered on the screen with villains on the left and heroes on the right. That would have been a great improvement from the similar challenge in Questprobe #3, but I am not positive that it would have offset the very abstract and linear nature of the game as it was designed up to this point. The best thing about this game is the one feature I didn’t get to play with: the teamwork system. It’s a natural progression from the previous games and is an awesome way to set up the second trilogy of the series. You can easily imagine it being applied to future games, perhaps featuring the Avengers or another Marvel team. 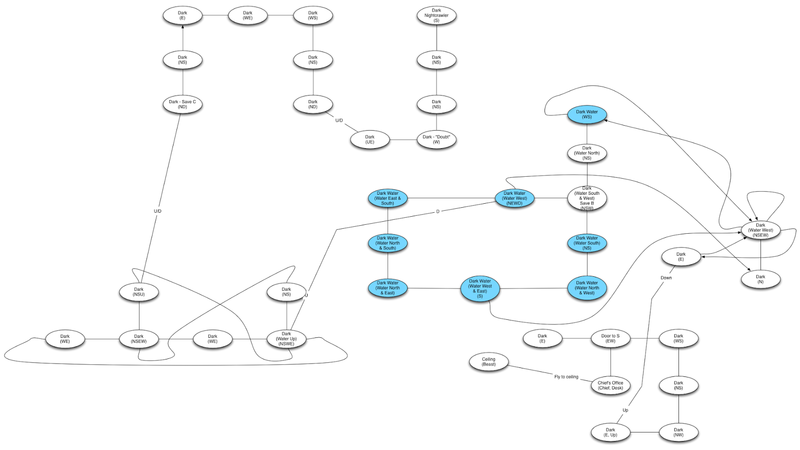 The way the characters may have had behaviors when you weren’t ordering them around might have been similar to Melbourne House’s The Hobbit (1982) or Infocom’s Planetfall (1983), but it is difficult to tell from the notes that we have how it would have ended up. Even without giving the characters agency, it would have been a nice switch-up from the two-character mold of Questprobe #3 and seems like it would have led to very interesting puzzles. Unfortunately, we will likely never see a finished product, but I feel very fortunate to have been able to explore as much of this game as I have. What I played was a very fun start. Who knows? Perhaps some overzealous fans will someday decide to complete the game? I wouldn’t hold my breath. Until then, Questprobe #4 will and must remain just a fragment of what could have been a really fun game. And flaws aside, I had a lot of fun with this and I hope you enjoyed reading about it. Next week will be our interviews with Scott Adams and Kem McNair! Tomorrow is my birthday! So even though it was never intended that way, and I actually played the game weeks ago, I'm going to consider it a birthday present. And it was a GREAT present. It was an honor to look at a lost corner of adventure game history and ponder, "What If?" Happy Birthday (for tomorrow) Joe! Happy Birthday Joe! What a cool review. I love pieces of "lost" gaming history like this. Well done! Whoops! Happy belated birthday, Joe! An X-Men team game would have been great, especially if things had moved forward from a graphical/interative point-of-view. When you look at games like Maniac Mansion or The Lost Vikings, there's lots of potential for puzzles involving multiple characters. That was a fun read. Really fascinating to see the game that never was. I'm really glad Scott kept a copy of the early game as it was, as well as his design notes, and even gladder that he allowed you access to them. 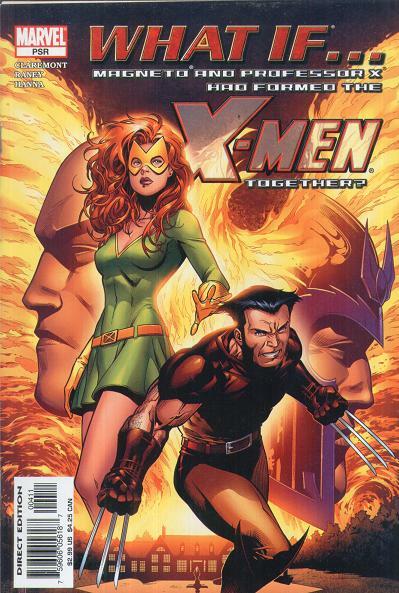 A bit of speculation around why X-men before Captain America and Spider-woman, could it be that it's the sale of the comics themselves that influenced who was picked which incidentally affects who was given a TV-show as well, but X-men wasn't even tried since the special effects budget would go through the roof? I mean, paint the hulk green must be rather cheap compared to all the different X-men's make-up and powers? Compare that to a game with limited graphics that almost only shows stills. Incidentally the first time I saw anything with the X-men was in the 90's Spider-man cartoon where they guest starred in a couple episodes. Of course I didn't read any marvel comics or watched the 90's X-men cartoon so I hadn't a clue about who they were (that is until I watched the 2000's X-men: Evolution). I suspect you are right. The Spider-Man live action shows were fairly rubbish so having more characters with powers and only practical effects seems quite difficult. Happy birthday Joe! Really interesting look at what might have been. In this case, it might be just comic books science, which is meant to just sound cool, but means really nothing. From the movies, I always assumed it was his metal hat that he made fly, as he seems to only fly when wearing it. That sounds like it would be a pain in the neck. Hehe. I didn't say my thought process made sense. Actually, if I was right, he'd have to fly upside down so he doesn't just fall out of his flying hat. 1) He always carries something metal to levitate with. 2) It's comics. Shut up. Perhaps he just eats lots of spinach. In fact, that would make a fun scene: Magneto is falling from roof top of a skyscraper, then he notices a spinach tin in a nearby window, uses his magnetic powers to catch it, does the Popey routine and swings himself to sky. Yet spinach contains chemicals which prohibit much of the iron's absorption according to a website called SCIENCE!!!!!!!!!!!!!!! "One cup of cooked fresh spinach contains about one milligram more iron than you'll find in 3 ounces (85 grams) of beef liver, which has long been known for its iron content. And far more than you'd encounter in a head of lettuce. In fact, you'd need to eat the entire head of lettuce to gain just 2.02 milligrams of iron, a fraction of what you'll find in spinach [source: USDA]. However, spinach also contains oxalic acid which inhibits iron absorption. So it's good to eat it with foods that enhance iron absorption like meat, fish, poultry, citrus fruits or certain vegetables like broccoli, sweet peppers, tomatoes and potatoes [source: Tsang]." Magneto eats tons of steak instead. 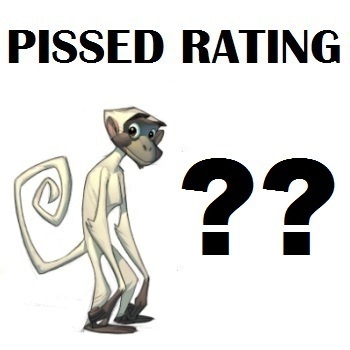 Have you read Andrew Hussie's Problem Sleuth? I hadn't even heard of it, but being the inquisitive type, I just looked it up and read the first 20ish comics. Was a bit of fun, but unlikely to be funny enough for me to keep reading. I've bought the Sleuth bundle on the theory that even if the games are all rubbish, I'm at least getting a large skim cappuccino's worth of fun trying them to find out they're rubbish. I know - I'm weird. I'm sure it ended with a Happily Ever After seeing that there are several movies and tons of comics about the X-men being produced decades after this game. Speaking of which, Beast is probably the only mutant whose power manifested at birth instead of puberty. Also, unless Lensher hit puberty way earlier than normal people, his abilities came to him in his preteen years (born between 1926-1929; first manifestation of mutant powers in 1935 - which means he was able to manipulate magnetic fields from ages 6-9). I thought Magneto manifested his powers in 1944 when that guy from Footloose separated him from his mother. I think there was a passive and active manifestation. Without the passive manifestation, Magneto would have died in 1935 when he and his whole family were executed by a firing squad. He apparently was able to stop the bullet from penetrating his body. His active manifestation was, yes, unleashed in 1944; where he used the power in an offensive manner. At the most basic level, he's basically manipulating electrons, and that's EASY to make light with (the challenge might be more along the lines of figuring out how to make only light on the visible spectrum without including some of the nastier, more damaging spectra). Also, has anyone told Magento that the strong and weak nuclear forces have been linked to electro-magnetism? Or even that he can easily manipulate (or probably just fry) most electronics? I'm going to be over here, being very grateful I do not live in a world where Erik Lensher(sp?) got a good physics education. Comic books and logic have not traditionally gone together. Thanks! I've been lurking around occasionally for a while, just felt talkative today. Hail all Lurkers at the Threshold! Leisure Suit Larry 5 – WON!